The eccentric, lovable character Arthur H. Patterson, was otherwise known as ‘John Knowlittle’, a typically self-deprecating pen-name for a distinguished local naturalist and prolific writer of books, poems and a nature diary for the Eastern Daily Press. 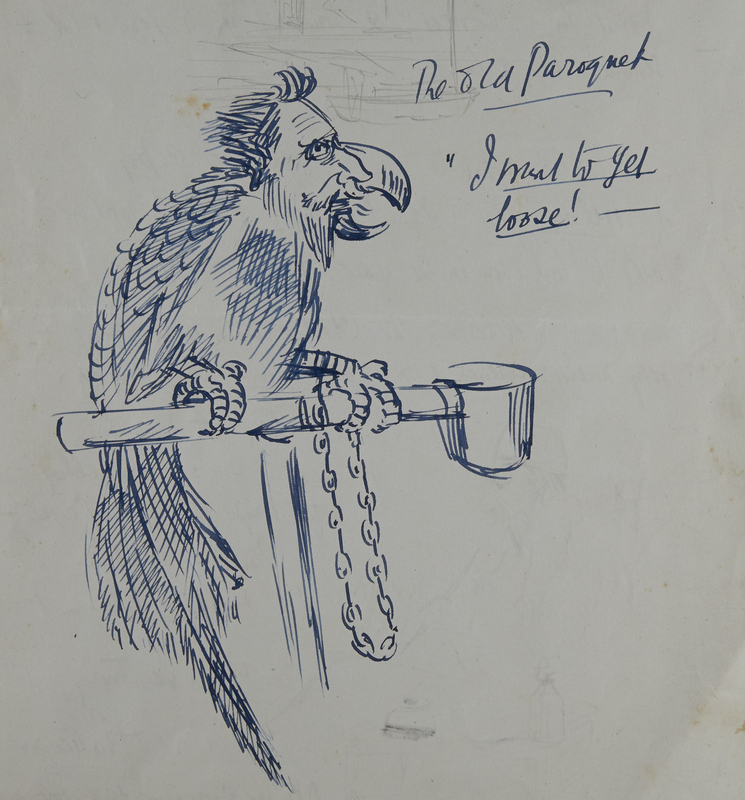 The Norfolk Record Office has a fascinating collection of letters, newspaper cuttings, natural history notebooks, diaries, maps and sketches by Patterson. 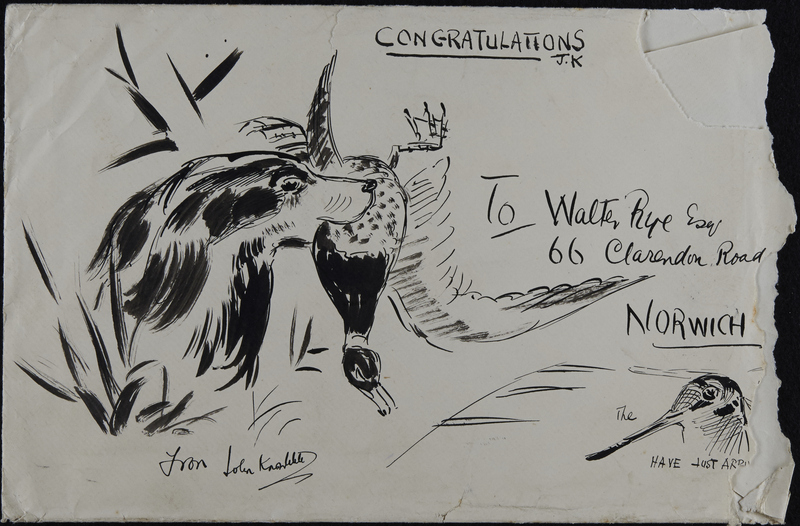 Many of the envelopes in one collection are illustrated with an ink sketch of a sea-bird, or a dog fetching a pheasant after a shoot. 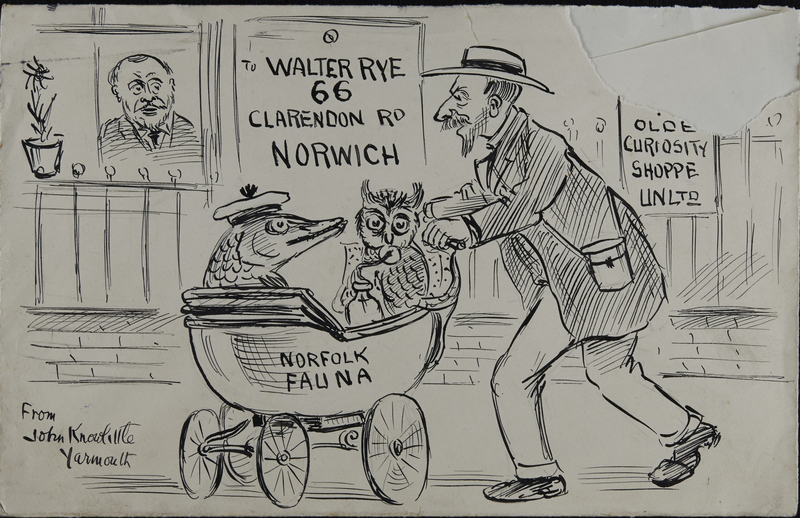 One even features a man pushing a pram containing an owl and a fish wearing a hat, where the man is clearly a hilarious cartoon of Patterson himself. Patterson was born in Yarmouth in 1857 in very humble circumstances. His parents lived in the Rows, and not one of his eight siblings reached the age of 21. He himself suffered poor health frequently. 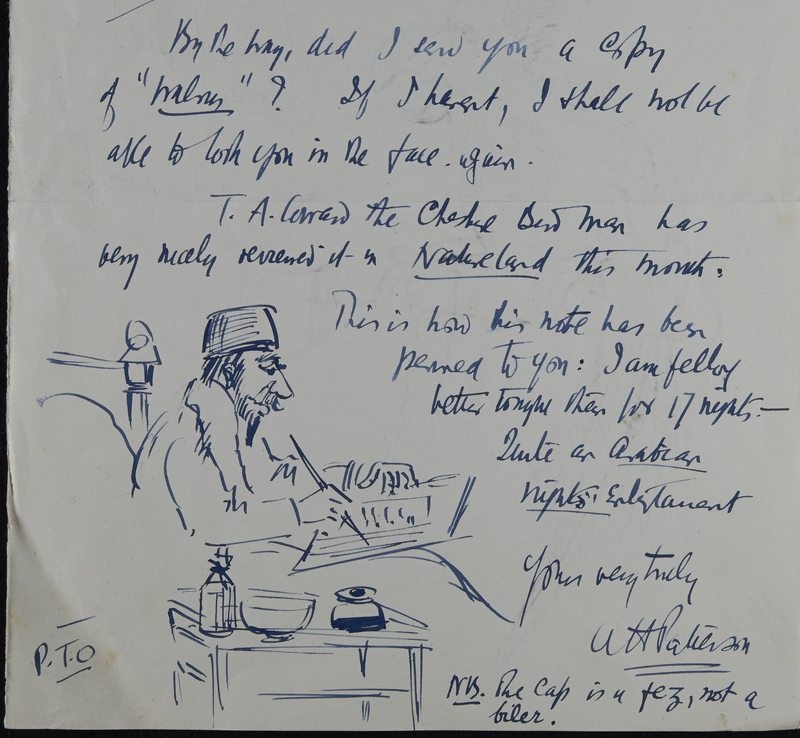 In one letter to ‘My dear friend Rye’ he complains that ‘I’ve just had two and a half weeks’ in bed huffing with flu and then the bronchitis’. Rye was Walter Rye, Mayor of Norwich in 1908-9 (the title did not become ‘Lord Mayor’ until 1910) and himself a well-known antiquary. Patterson’s career was chequered. His obituary in the EDP on 28 October 1935 records that he worked as a ‘pupil teacher, draper’s warehouseman, postman, zoo keeper, sewing machine canvasser, showman and school attendance officer’. 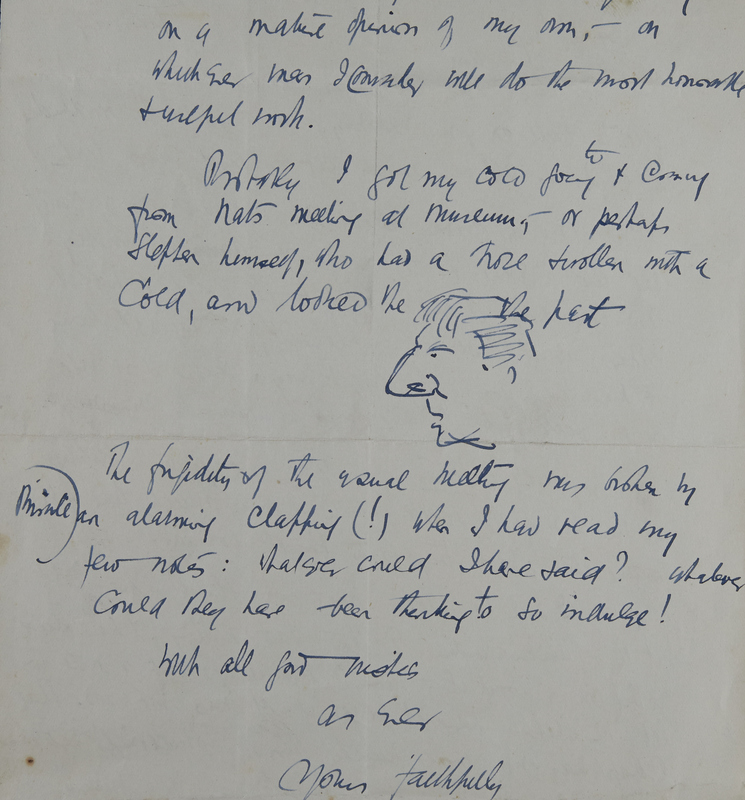 He would get up early and walk the beach or Breydon Water in order to pursue his great love of nature, before starting work at 8 a.m.
Evelyn Weston, writing of Patterson in The Field in November 1935, says, ‘His dry humour was a delight and his kindliness unbounded. His study at Ibis House was a regular den. Once I saw a locust there, waiting to be sketched for the columns of the Eastern Daily Press; another time it was a huge and revolting spider with long, hairy legs.’ It was not uncommon for Patterson to greet visitors wearing a plimsoll on one foot and a slipper on the other, because he could not find the pair of either. Arthur Patterson in a punt. Image courtesy of Picture Norfolk. 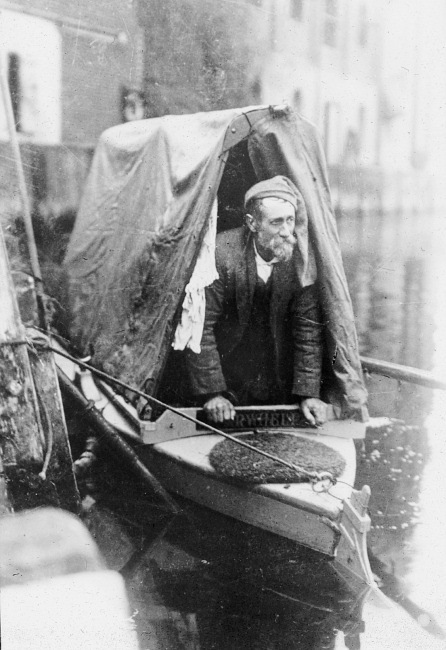 Weston also remembers the houseboat Patterson owned, Moorhen 111, and has ‘joyous recollections of a sort of Mad Hatter’s tea party’ where grass had to be removed from the kettle before it was used to boil water for tea. There was no milk for the tea, but there was sugar, and the pair bought a bag of buns to make a picnic. Our current exhibition, Ballots and Bills: Exploring Norfolk’s Parliamentary Past features some of Patterson’s satirical watercolour cartoons about the 1895 General Election. The exhibition is free to view any time during our opening hours. This entry was posted in Events, Snapshots from the Archive and tagged arthur patterson, Breydon, cartoon, EDP, general election, illustration, nature, walter rye, Yarmouth. Bookmark the permalink.